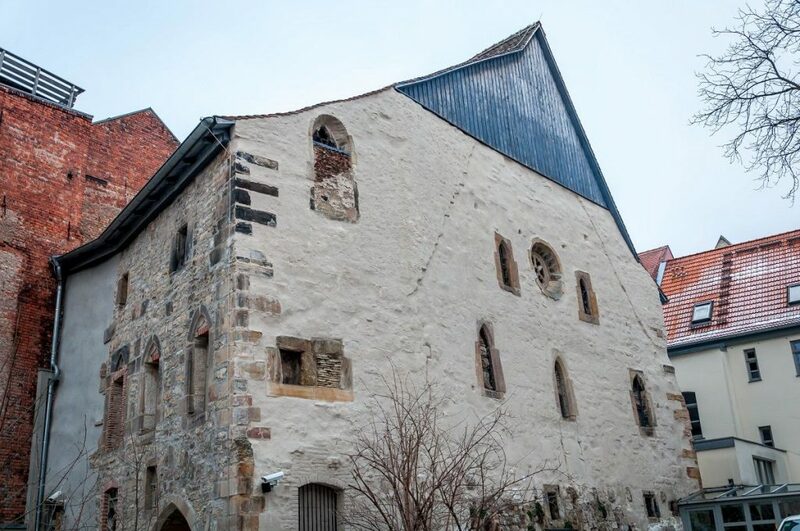 The Jewish community of Erfurt first appears in the historical record in the late 11th century, with the earliest recorded building of the synagogue dating from then. For centuries Jews and Christians lived side by side in the centre of town. There is more detailed evidence from the 13th century. We learn from tax lists and deeds that Erfurt Jews worked in banking, and dealt not only with local towns and aristocrats, but had business relationships across the Holy Roman Empire. Their residential neighbourhood was in the immediate city centre, in the quarter between the town hall, Krämerbrücke and Michaeliskirche. Here they lived in close proximity with Christian merchants and here stood their representative synagogue. Close by was a mikveh, a Jewish ritual bath. The cemetery was outside the residential area at Moritztor. Eminent scholars lived and taught in Erfurt. Evidence for the developed intellectual life are 15 Hebrew manuscripts that belong today to the Berlin State Library. The wave of Jewish persecutions, reached Erfurt in March 1349. During the pogrom on 21 March 1349 the whole Jewish community of Erfurt was destroyed and up to 900 people died. A merchant subsequently converted the Old Synagogue into a storehouse. A short time later, probably from 1354, Jews became resident in Erfurt again. The Erfurt Council had a synagogue built behind the town hall between 1355 and 1357 for the new community. The Jews lived to a large extent in the same quarters, but now for the most part in rented accommodation in municipal “Jews houses”. There were also in this second settlement some very wealthy and influential families who worked in overseas trade and finance. Numerous poorer Jews lived from pawn broking, trading and the manufacture of shofars. In the 15th century anti-Jewish sentiment was growing in Erfurt. In 1453 the municipal council revoked the protection of the Jews, and all Jews left the town around this time. Since the year 1454 Jews were no longer tolerated in Erfurt. The Jewish dwellings were sold, the synagogue was converted into an armoury and the cemetery was razed. There was no established Jewish community in Erfurt between the expulsion by the council in 1453 and the Napoleonic Wars. When the Principality of Erfurt became a French imperial territory it was subject to the Napoleonic code, the French civil code of laws formulated in 1804, which permitted freedom of residence. David Salomon Unger was the first Jew to become a citizen of Erfurt in modern times. In the 19th century a community was re-established and grew rapidly. In the night of the 9 to 10 November 1938 Erfurt’s Synagogue was ransacked by the SA and set on fire. The gymnasium of the school on Meyfartstraße served as collection point for approximately 200 men who were then taken to Buchenwald Concentration Camp. 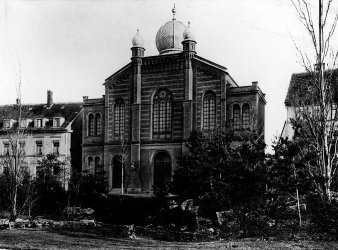 On 6 April 1939 all properties of the former synagogue community were appropriated by the city of Erfurt. In 1932 there were 1,290 inhabitants with Jewish confession of faith in Erfurt. Following the transfer of power to the National Socialists the census in June 1933 only showed 831, in May 1939 only 263. A small group returned to Erfurt from Theresienstadt Concentration Camp. In 1945 only about 20 members of the re-established Jewish community headed by Max Cars had been part of the pre-war synagogue community, but their numbers were augmented by incomers from other regions, mostly from Eastern Europe. At the same time many were emigrating to Israel. On 31 August 1952 the New Synagogue was inaugurated on the site of the destroyed Great Synagogue. This is where community life and worship take place today: Since 1990 the Erfurt community has enjoyed an influx of members, mostly from the states of the former Soviet Union. Today the Jewish Community of Thuringia has around 800 members. 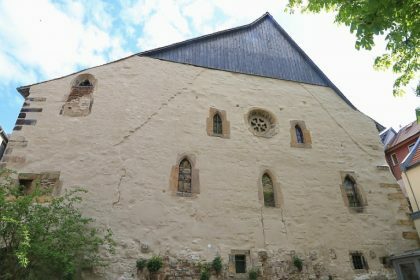 The Old Synagogue, with parts dating from the 11th century, is the oldest synagogue in Central Europe that has been preserved up to its roof. 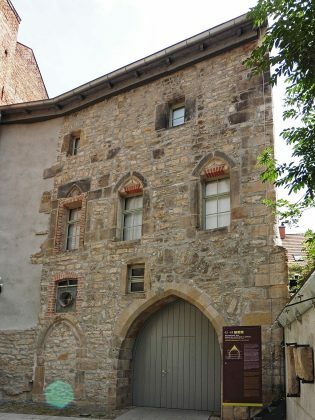 In 2009 a museum was created here, in which medieval reminders of the Erfurt Jewish community can be viewed. The exhibition in the Old Synagogue shows the history of the first Jewish community in Erfurt. In the courtyard gravestones of the destroyed medieval cemetery can be seen. The building history of the synagogue is the subject on the ground floor. The cellar houses the treasure found near the synagogue, which a Jew buried during the pogrom of 1349. The Erfurt Hebrew Manuscripts are addressed on the upper floor. The great synagogue designed by Frankfurt architect Siegfried Kusnitzky was inaugurated on 4 September 1884. The Great Synagogue could accommodate 500 people, was richly decorated inside, adorned with coloured paintings, and had an organ. It was the centre of the community for 45 years – until its destruction in 1938. The New Synagogue was built in 1951/52 on the site of the Great Synagogue and was inaugurated on 31 August 1952 and is today the centre of a lively community life. On 10 July 1840 the Jewish community consecrated the Small Synagogue. It was used as a house of worship for only 44 years, until 1884, since the community was growing fast in the 19th century. The community built the Great Synagogue and sold the Small Synagogue to a merchant. He used the house as a storage facility and production building. In 1918 the municipality installed apartments. Interest in the Jewish heritage grew in the 1980s. The town had the building history of the synagogue researched and the building restored. 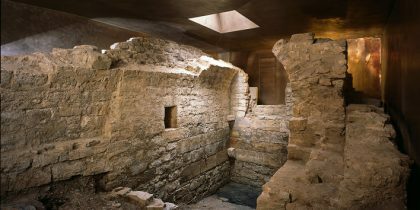 Building researchers found the mikveh as well as the Torah shrine and the women’s balcony. So the prayer hall presents itself today in the almost original condition. The Small Synagogue serves today as a meeting centre and shows an exhibition on Jewish life in Erfurt in the 19th and 20th centuries. At Moritztor, today’s Große Ackerhofsgasse, the cemetery for Erfurt’s Jewish community was located in the Middle Ages. It is probable that the site was used for burials ever since the beginnings of the community. The oldest gravestones still preserved today are from the 13th century. In 1453 the cemetery was razed and in its place a municipal barn and later the large granary were erected. The gravestones were used as building material all over town, which is why until today they are occasionally rediscovered in buildings or in the pavement. In remembrance of the cemetery to start with a memorial stone was erected in 1996. Since the year 2000 there were discussions to make the cemetery visible again, and the realisation started in 2007. When a community re-established itself in Erfurt in the 19th century, as the community rapidly grew the medieval cemetery became too small for further burials. Since the opening of the New Jewish Cemetery in 1878 members of the Jewish community are buried there. It is as well the only one actively used in Thuringia. Documentary evidence on the mikveh goes back to the middle of the 13th century. It shows that the Jewish community had to pay charges for the ritual bath and for the land, initially to the bishop, later to the city of Erfurt. From the medieval tax lists we learn that the environs of the mikveh were densely populated. 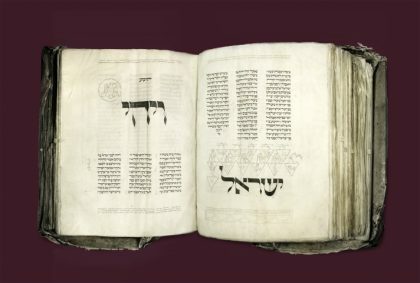 The Erfurt Hebrew Manuscripts are evidence of the importance of the medieval Jewish community. Fifteen manuscripts from the 12th to the 14th century have been preserved, more than from any other community. Apart from four Torah scrolls there are, amongst other things, four Hebrew Bibles bequeathed as well as a machzor. The manuscripts probably came into the hands of the Erfurt Council during the pogrom. It sold some books shortly afterwards, others stayed in the possession of the city until the 17th century. How they finally ended up in the library of the Evangelical Ministry in the Augustinian Monastery is unclear. The Ministry sold them to the Royal Library in Berlin, today’s Berlin State Library, in 1880. In a cooperation project between the network “Jewish Life Erfurt”, the Berlin State Library – Prussian Cultural Heritage, and the Free University of Berlin, chair of Jewish studies, the specialist Annett Martini is researching the Erfurt Hebrew Manuscripts. 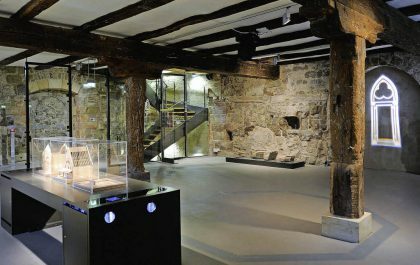 The results are integrated into the permanent exhibition in the Old Synagogue. 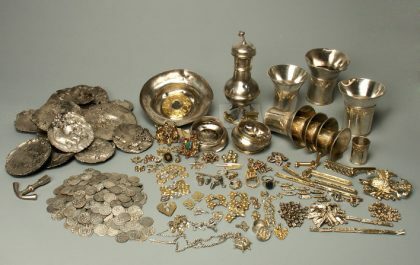 In the cellar of the Old Synagogue, the so-called Erfurt Treasure is exhibited, which was most likely buried during the pogrom of 1349 – a unique find in size and composition. 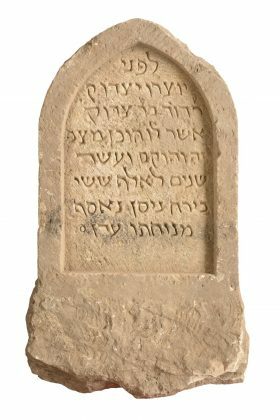 It was discovered in 1998, shortly before archaeological investigations on the site of Michaelisstraße 43 – not far from the Old Synagogue – were completed. It had been hidden underneath the wall of a cellar entrance. The treasure has a total weight of nearly 28 kilogrammes. With around 24 kilogrammes, 3,141 silver coins and 14 silver ingots of different sizes and weight form the biggest part of it. 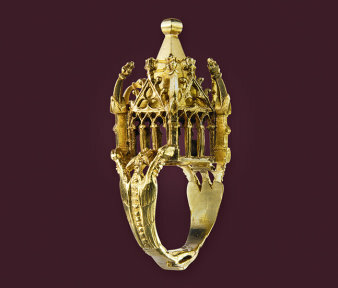 Moreover, the hoard contained over seven hundred individual items of gothic goldsmith’s art, some highly accomplished. Among them is an ensemble of silver tableware, consisting of a set of eight beakers, one ewer, one drinking vessel as well as a double cup. Among the pieces of jewellery, eight brooches of different sizes and form, partly with abundant ornamentation of precious stones, stand out as well as eight gold and silver rings. Yet, smaller objects such as parts of belts and garment trimmings numerically form the biggest part of the goldsmith’s works. The treasure’s most outstanding object is a Jewish wedding ring from the second quarter of the 14th century. Most captivating is the craftsmanship of its Gothic miniature architecture, made of pure gold. That, accordingly, is what makes the Erfurt Treasure so unique and why it has already been exhibited in New York, London and Paris before being put on permanent display in the Old Synagogue since 2009. 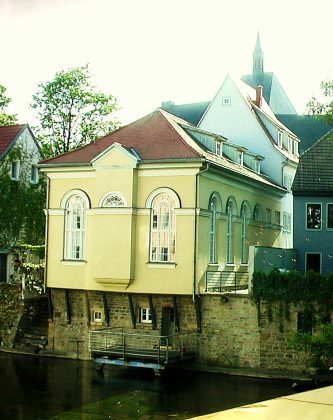 The Jewish Community of Thuringia has, next to its synagogue, a cultural and education centre. It hosts Via Schalom, the Jewish Cultural Initiative in Thuringia, founded in 2000, which promotes a better understanding between Jews and non-Jews via a number of cultural events; Radio Schalom, the community radio station; and a coffee shop.